The beginning of the week is always hectic since my son’s extracurricular activities are scheduled every Monday (art), Tuesday (riding) and Wednesday (violin). It’s a given that I’m going to follow one of three paths: 1) assemble a casserole of pre-cooked ingredients earlier in the day that I can toss in the oven, 2) reheat a forgotten frozen leftover that displays signs of imminent freezer burn or 3) order pizza/chinese. If I’m totally desperate for something “homemade,” it’ll be breakfast-as-dinner. Yesterday, I made a chicken and wild rice casserole– without canned soup, mind you. (It’s really not difficult to make your own cheese sauce; folks are freaked out by the term “roux,” but it’s just a fancy French word for fat and flour cooked together then whisked with a warm liquid– if you can make gravy from drippings, you can make bechamel)! The boys said it was “OK,” so I’m not going to post the recipe (it’s on Pinterest). Last night my husband reminded me that we still had some pulled pork in the freezer from our summer party, along with a tub of our new favorite mustard-vinegar sauce. I even had cabbage in the fridge to slice into coleslaw. All I needed were potato rolls and we’d have the perfect summer meal. I’m so averse to the hassle of going out in the rain (it’s been a steady drip for days in and around DC) to buy store-bought rolls, that I decided I would try to make my own potato rolls. Found a recipe online and went with it because the blogger said the rolls taste good DAYS after when reheated. Although I’m a very experienced baker and spent the last year creating artisan-style baguettes, ciabatta and boules in my non-steaming home oven (next house!) 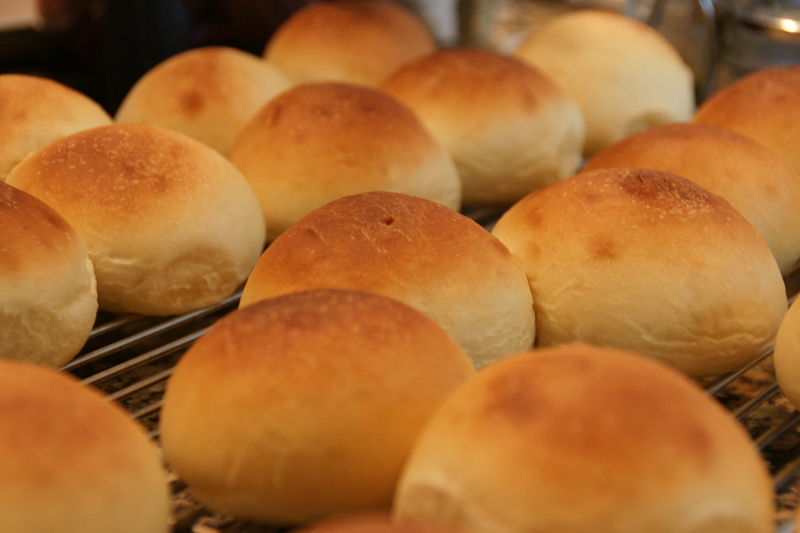 with poolish, pate fermentee and catch-your-own-yeast starter, I have never made potato rolls. After I reviewed the recipe, I decided I wasn’t going to do it in the standing mixer; for me there’s too much inconsistency with the dough hook, and after all, I’m a SAH mom on a rainy day. I also didn’t use any bread flour, as I like to save that for my baguettes. The dough seemed wet to me throughout the process and after kneading the six cups (and then some) of flour, I made my peace with a soft, and tacky dough and chalked it up to the wet weather. I could still feel tiny bits of mashed potato, but figured they’d break down the way oatmeal does, in the baked product. To my great relief, the first rise went fine (I was expecting a leaden lump of dough) as did the second. I baked the rolls on top of thin silicone mats on half-sheet pans, on the upper and bottom third racks (I have five rack positions). Twelve minutes at 400 degrees. I think the 400 degrees is high for this kind of bread– tops were browning too quickly so I rotated the pans between racks after six minutes. In another two, I topped both pans with foil and lowered the heat to 350 degrees which is my usual baking temp for sandwich bread, and reset the timer, adding 5 minutes to whatever time was left. I use an instant read thermometer to test my breads; I find the “hollow thump” test to be utterly unreliable for bread loaves, especially since you can’t see the color of the crust inside the bread pan. 195 degrees on my instant read is ideal. I tested the lower pan and they were perfectly done at 196 degrees. I pulled the pan out, left the other pan on the top rack and set the timer for four minutes. In the meantime, I pulled those beautiful baby buns off the pan and onto a rack. Ditto with the second pan when it was done. I know you’re supposed to wait a bit to let the proteins coagulate, but I just couldn’t. I lifted one off the rack; it was hot and so soft to the touch. I pulled it apart quickly and took a bite– and will NEVER buy potato rolls from the store again (even my favorite Pennsylvania Dutch brand)! My son and his friends also gave them a big thumbs-up! So tonight, we’re having pulled pork BBQ with our vinegary sauce, coleslaw atop my yummy potato rolls– our farewell to summer supper! Bravo Maria! Can you post the vinegar sauce and the potato roll recipe? How can I get auto-updates on when you post? Glad you like it (and that you found the link to the potato roll recipe after all)! I will post the bbq sauce recipe as soon as I locate it. It was online and a nice change to the tomato ketchup kind (also a fave, but more with ribs)! Bread baskets for christmas for family, namely moi!